Right perception arises from direct observation, inference, or the words of others. Knowledge embraces personal experience, inference, and insights from the wise. Misperception is false knowledge, not based on what actually is. Misunderstanding comes when perception is unclear or tinted. Conceptualization is based on linguistic knowledge, not contact with real things. Imagination is kindled by hearing words, seeing images, or experiencing feelings. Deep sleep is a pattern grounded in the perception that nothing exists. Deep sleep allows us to withdraw from conscious awareness. Remembering is the retention of experiences. 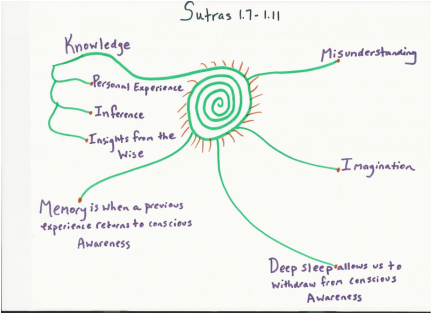 Memory is when a previous experience returns to conscious awareness. Both practice and non reaction are required to still the patterning of consciousness. Consciousness is elevated by Abhyasa (Devoted Practice) and Vairagya (Remembering the Self).